I guess it was a big weekend for flash mob proposals. This one apparently took many nights of secret rehearsals, and the help of several talented friends. Jamin and Valerie happen to be two of the directors of Marvels Dance Company, so I imagine willing dancers were not in short supply. Congratulations to the happy couple. 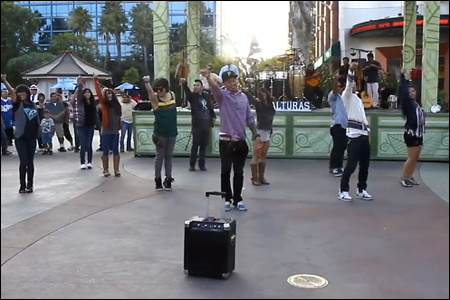 More here: Downtown Disney Dance Flash Mob Marriage Proposal Viral Video. And here's one of the friend/backup dancer's version of the story: The Fairytale Beginning.